Cantuccini (or biscotti) are crunchy, twice-baked Italian almond cookies. Our recipe is delicately spiced, and jam-packed with candied peel, orange zest and rich nuts. We love to dip them in a glass of something boozy, or a steaming cup of proper coffee. Biscuit heaven! Once opened, keep in an airtight container and eat within 7 days. These cantuccini are baked for us by our friends at The Authentic Bread Company, using our recipe. The Authentic Bread Company was started in 1995 when Alan Davis, a former BT engineer of 26 years, decided to go professional with his passion for organic baking. 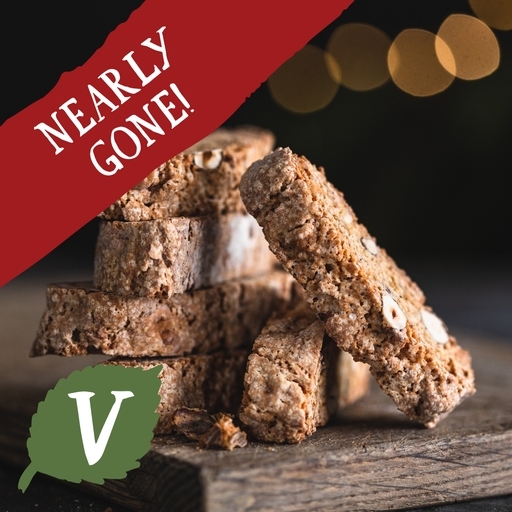 Based deep within the Gloucestershire countryside, the business is still family-run, using time-honoured traditional methods and the very best organic ingredients to produce their wide range of award-winning baked goods. Wheat flour (wheat, calcium carbonate*, iron*, niacin*, thiamin*), cane sugar, egg, almonds (10.5%), hazelnuts, candied lemon peel (lemon peel, glucose syrup*, salt*), candied orange peel (orange peel, glucose syrup*, salt*), orange zest, cream of tartar*, mixed spice, cinnamon, bicarbonate of soda*.